Amid a saturated coffee shop market, a number of cafes have transformed themselves into multi-faceted places. Many have created new types of coffee-based beverages and other drinks. Coffee chains have also long been selling premium baked goods, including cakes and tarts. Meanwhile some have started to sell clothes or other fashion items in addition to food and beverages, while others even provide private spaces for studying or reading. Despite various efforts to attract more customers, only a few giant coffee franchises, such as Starbucks, have survived and continue to fare well. 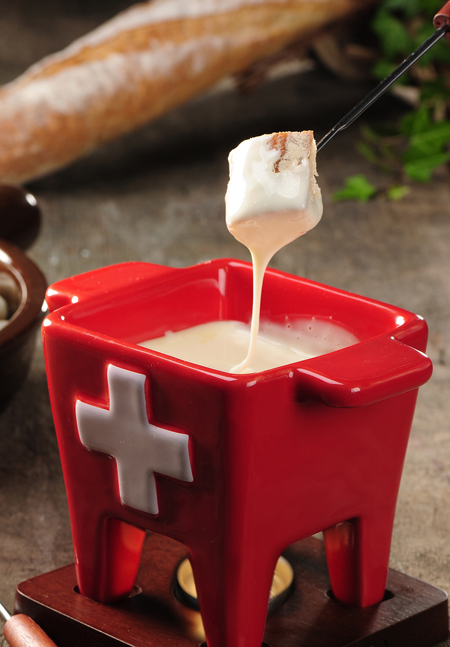 A cheese fondue at Sunrich Courtesy of SR Corp.
With the countless number of coffee shops, many coffee enthusiasts are unsure of where to go. Given the circumstances, those wishing to enter the coffee shop market now tend to specialize in a certain concept or item. They are betting that consumers who are regular cafe-goers will pay more to have high quality, specialized beverages and desserts. According to Kim Hyun-woo, CEO of Storeplan, a dessert company, unlike in the past when taste, atmosphere and service were the most crucial factors for cafes to succeed, the keys today are concept, balance and quality. The three cafes introduced here each focus on one item; ginseng, cheese or red bean. Korea Ginseng Corporation (KGC) launched Cafe G, a cafe specializing in ginseng, in Gangnam, southern Seoul, earlier this month. The cafe is located right next to the main store of Cheong Kwan Jang, KGC's brand of Korean red ginseng. Customers can look around and buy the red ginseng products at the store and then enjoy a cup of ginseng coffee or tea at Cafe G.
"Red ginseng has been a popular health food product among those in their 40s and 50s. We were thinking of a way to approach those in their 20s and 30s and then realized it is to open a cafe which is a familiar place for young people," Cha Ju-hyoung, manager of KGC, told The Korea Times at Cafe G.
In line with a growing interest in health, the demand for healthy drinks and food has been increasing, evidenced by the launch of new healthy items in a number of existing coffee shops. "As KGC is one of the country's representative red ginseng companies, we thought it would be competitive to open a cafe specializing in red ginseng, generating a synergy effect with our brand value," Cha said, adding that the main purpose is to raise public awareness of Cheong Kwan Jang red ginseng. Although it hasn't been long since Cafe G opened, the cafe is going viral among middle-aged customers. Two middle-aged male customers said that it was their fourth visit since the store opened. Red ginseng grapefruit aide (left), premium honey ginseng tea (right), red ginseng cranberry biscuit (left), red ginseng praline chocolate (center) and red ginseng tart (right). / Courtesy of Korea Ginseng Corp.
"I have a craze for health drinks and often visited the Cheong Kwan Jang store to buy red ginseng products," said Lee Joong-seon, a 41-year-old office worker. "The taste of beverages at Cafe G is better than I expected. Besides, the price is also reasonable," Jung Bong-gyoo, 47, an independent businessman, said while sipping a ginseng latte. 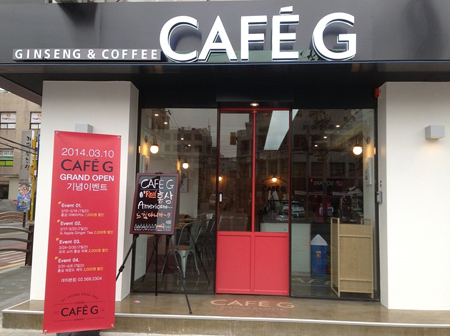 All the menus of Cafe G contain some amount of red ginseng, including Ginseng Americano and Ginseng Cafe Latte. In particular, some unique menus such as premium honey ginseng tea and G apple ginseng tea are not seen in any other coffee shops. The taste of ginseng tea is similar to watered-down red ginseng concentrate. As for dessert, some contain chunks of red ginseng, but taste sweet, unlike the bitter taste of original red ginseng. The price of beverages and snacks range from 3,000 won to 8,000 won, which is reasonable considering that ginseng is an expensive product. 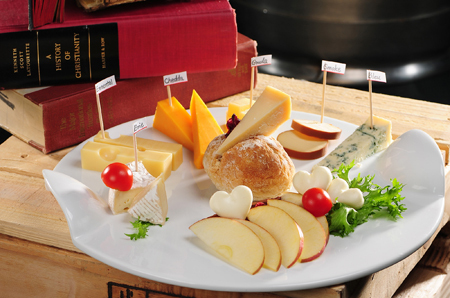 A cheese plate at Sunrich, whose main branch is located in Gangnam, southern Seoul / Courtesy of SR Corp.
Sunrich is a cheese cafe located in Gangnam, southern Seoul, launched in 2011 by SR Group, Asia's biggest cheese manufacturing company. "Only a few years ago, cheese was somewhat an unfamiliar product to Korean customers. We opened the cheese cafe with the aim of familiarizing consumers with cheese," said Shin Moon-young, assistant manager of SR Corporation. The company, which had initially focused on business-to-business (B2B), decided to start business-to-customer (B2C) by operating Sunrich. As a growing number of young people are becoming cheese-lovers after trying real cheese abroad and also in Korea, Sunrich has become a special place where they can indulge in every kind of cheese fused in coffee or desserts. "There are too many coffee shops out there. I think cafes need to have their own story in order to survive. A cafe decorated with Audrey Hepburn pictures inside and outside of the store, or a cafe specializing in a certain product like us are examples," Shin said. The most popular menu items in Sunrich are the cheese plate (30,000 won), cheese fondue (13,000 won), cream cheese latte (5,000 won) and crushed ice with cheese" (9,000 won). "Our main customers are those in their 20s and 30s and, an increasing number of young housewives are also visiting," Shin said. / Courtesy of Korea Ginseng Corp. 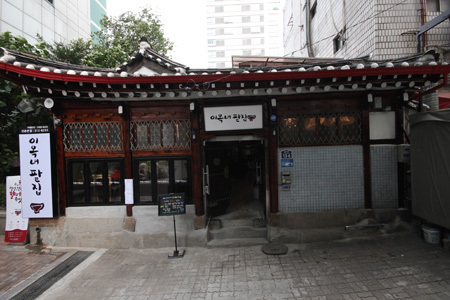 The Lee Oknyeo redbean house introduced itself as a cafe launched by nostalgia for rice and adzuki-bean porridge made by master Lee Ok-nyeo. "Many people know that the red bean is good for health. But it requires hard work to make food with red beans. We would like more customers to become familiar with red bean-based drinks and food, and decided to open a red bean specialized cafe," said Kim Ha-young, an official at the Lee Oknyeo redbean house. The diverse menu items range from traditional adzuki-bean porridge (6,500 won), adzuki bean sherbet (7,000 won), to Korea's street snack called "Bungeobbang," fish-shaped pastries containing red beans inside (1,500 won). "As we specialize in red bean, which is our traditional food, we try to create a healthier taste for customers," Kim said. OKRUMONG is another red bean specialty cafe located in Sinchon, Seoul. The CEO Kim Hyun-woo launched OKRUMONG as a way out of the saturated, regular coffee shop market. "The adzuki bean sherbet has long been loved by Korean customers. 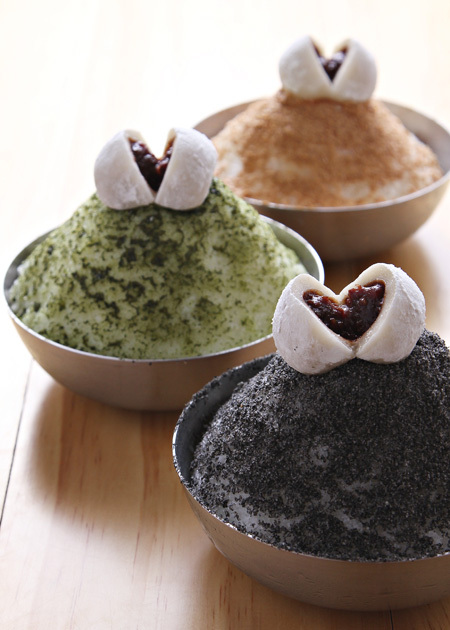 We were thinking how to develop this qualified item and finally thought out the concept dessert cafe OKRUMONG," Bae Hye-jin, accounting manager, said. People of all ages and genders are coming to the red bean dessert cafes to enjoy healthy red bean drinks and snacks, according to each official.